New Doctor Strange UK featurette movie clip released Yesterday. Yesterday, the Marvel Studios folks dropped this new UK featurette/movie clip (below) for their new “Doctor Strange” action/sci-fi movie. It looks really cool, featuring new scenes with awesome special effects as Dr. Strange realizes powers far greater than he could ever have imagined. We also see brief interview clips, featuring main stars: Benedict Cumberbatch, Rachel McAdams, Tilda Swinton and Chiwetel Ejiofor. They deliver up a a few spoiler bites for the film, and more. Check it out, below. In the new movie, we’ll see “Talented neurosurgeon ,Doctor Stephen Strange , after a tragic car accident, have to put his ego aside to discover the secrets of a hidden world of mysticism and alternate dimensions. New Doctor Strange possible spoiler reveals a villain Dormammu appearance. According to a new report from comicbookmovie.com, it has recently been revealed that a possible appearance from the iconic vilain, Dormammu, could take place if their intel pans out to be legit. Again, they don’t know if this is legit, and it certainly hasn’t been officially confirmed by Marvel Studios or Disney so it’s all speculation at this point. However, if it turns out to be true, the movie will get even more interesting than it already is. Doctor Strange two new movie photos hit the net. 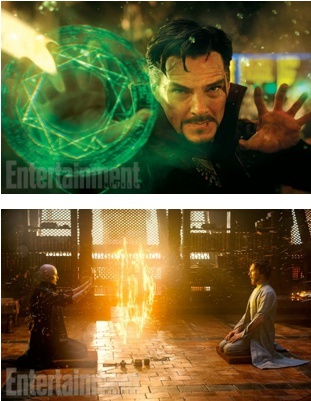 Recently, the folks over at Entertainment Weekly served up these 2, new movie pics (above) for the upcoming sci-fi/action flick, “Doctor Strange,” and they look extremely cool and quite intense, showing us more of the special effects that we’ll see take place as Doctor Strange learns about all the other realms that exist beyond this 3 dimensional plane. Doctor Strange portrayer, Benedict Cumberbatch, also commented on his character, saying: “This man reaches the very bottom and then more. You think, How much more can this guy take? He’s broken, he gets up again, he’s broken, and that’s really what makes him a superhero. A lot of people have asked me, ‘What makes him a superhero?’ That’s really the answer I should have given. It’s not the Cloak of Levitation. It’s not the Eye of Agamotto. It’s about his staying power. It’s a marathon and not a sprint. 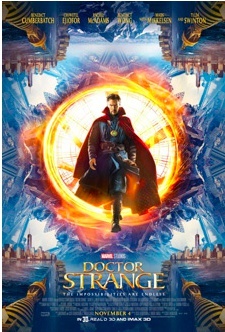 The official storyline for the movie, reads like this: “Talented neurosurgeon ,Doctor Stephen Strange , after a tragic car accident, must put ego aside and learn the secrets of a hidden world of mysticism and alternate dimensions.